Cataracts are when the lens, a small transparent disc inside your eye, develops cloudy patches. Over time these patches usually become bigger causing blurry, misty vision and eventually blindness. When we're young, our lenses are usually like clear glass, allowing us to see through them. As we get older, they start to become frosted, like bathroom glass, and begin to limit our vision. 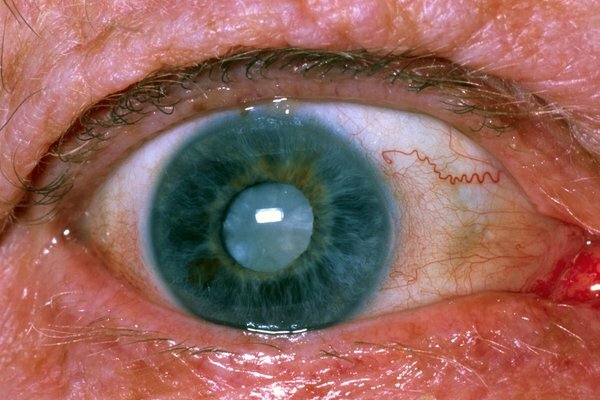 Cataracts usually appear in both eyes. They may not necessarily develop at the same time or be the same in each eye. They're more common in older adults and can affect your ability to carry out daily activities such as driving. Cataracts can also affect babies and young children. For more information, read about childhood cataracts. If you wear glasses, you may feel your lenses are dirty and need cleaning, even when they don't. Cataracts aren't usually painful and don't make your eyes red or irritated, but they can be painful if they're in an advanced stage or if you've got another eye condition. Your optician will do a series of eye tests, including a visual acuity exam, which measures how well you see at various distances. If your optician thinks you have cataracts, you may be referred to an eye specialist (ophthalmologist) for more tests and treatment. If your cataracts aren't too bad, stronger glasses and brighter reading lights may help for a while. But cataracts get worse over time, so you'll eventually need surgery to remove and replace the affected lens. Surgery is the only treatment that's proven to be effective for cataracts. If you have cataracts, it could affect your ability to drive. You must tell the Driver and Vehicle Licensing Agency (DVLA) if you have cataracts in both eyes. If you drive a bus, coach or lorry, you must inform the DVLA if you have cataracts in one or both eyes. For more information, read about cataracts and driving on the GOV.UK website.